The race will begin with a single-loop 1,900m swim in the Mediterranean Sea and exits on the amazing Levante beach of Puerto Banús. The 90km bike starts in the famous “Gold Mile” before crossing through the city of Marbella and the Ojén Port before conquering the legendary "caracolillos" in this picturesque location. Athletes will then race through Monda, Coín and Cartama before returning to Transition in Puerto Banús. 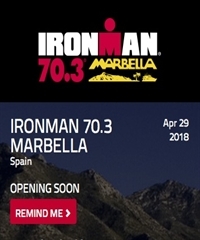 The two-lap run course will take place along the legendary seafront promenade of Marbella supported by the cheering spectators as they reach the finish line located in the sand of Puerto Banús Beach.